If you are in the Bismark area stop in and say hi! We are having an educational booth on human trafficking at an event held by Pride, Inc. Pride, Inc. is an organization that seeks to empower people to be actively involved in decisions affecting their lives, to foster self-worth and personal success, offering integrated continuum of services, and lastly to give evidence of quality services to people supported. This event was on May 12, 2016. 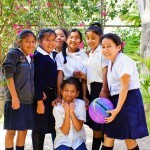 View all upcoming events for The GOD’S CHILD Project at www.GodsChild.org.